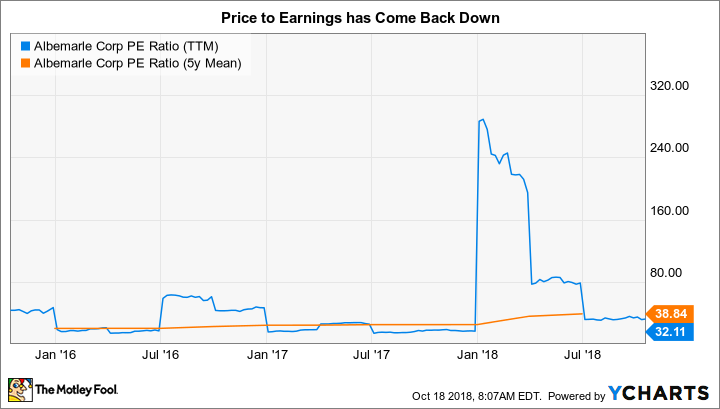 Is Albemarle Corporation a Buy? This specialty chemicals company is focused on serving high-tech industries. Is it a buy after losing a third of its value? Albemarle Corporation's (NYSE:ALB) stock has advanced by more than 300% over the past decade. However, it's down about 33% from its late 2017 peak. Meanwhile, the specialty chemicals company has leading positions in all three of its main product lines, and serves a number of high-tech and growing industries -- notably the electric-automobile market. Is this pullback a chance to buy on the cheap? Albemarle has three product lines, all of which have been doing relatively well in 2018. Bromine is used in flame retardants in electronics products; the company's bromine operation, which made up 26% of second-quarter sales, has been growing revenue in the low- to mid-single digits this year. The catalysts business serves the oil refining sector. Revenue growth in this division was material in the second quarter (up 23% year over year, adjusted for an asset sale) after a low-single-digit gain in the first. Catalysts accounted for 33% of second-quarter sales. The third of the company's core businesses, lithium, made up 37% of second-quarter sales. Revenue was up 38% in the first quarter and 30% in the second, with volume gains a key factor in the advance. This is where the real action is, largely because lithium is an important input in the electric-car market, a sector that has driven material demand growth for lithium. Albemarle is the largest producer of lithium in the world. There are two big things going on right now. The first is what appears to be investors pulling back their expectations in the lithium market, where prices peaked in early 2018 and have been under pressure since. There's a fear that supply will outstrip demand over the near term. Investor enthusiasm during the lithium price spike pushed Albemarle's price-to-earnings and price-to-book-value ratios well above their five-year averages. After the sizable stock pullback this year, though, those ratios have fallen below their five-year averages. Effectively, the lithium hype pushed the stock up too far, too fast, and investors have reevaluated the situation as lithium prices have weakened. On that front, the stock pullback is completely reasonable, though it may be overdone based on the the historical averages for P/E and P/B. The second notable issue is that Albemarle has big plans on the construction front in the lithium business. Capital investment through the first half of 2018 was $281 million, up from just $98 million in the same period of 2017. The core reason for the increase was investment in the lithium business. The spending isn't going to stop, either, with the high end of the company's full-year capital spending projection at $900 million. The company's longer-term goal is to increase lithium production by as much as 60% by 2021. ALB PE Ratio (TTM) data by YCharts. Albemarle is using the the cash generated by the bromine and catalyst businesses to help fund this spending. However, management has hinted that it may someday become a pure-play lithium company, which could mean a sale or spinoff of the company's other businesses. If you're looking at this company, you need to focus most of your attention on lithium. ALB Price to Book Value data by YCharts. The long-term picture here on the demand side remains fairly strong, according to Albemarle. The company is projecting demand for lithium to be more than three times higher in 2025 than it was in 2017. Notably, auto demand is projected to drive that growth, with an incredible 35% compound annual growth rate between 2017 and 2025. By that point the auto sector will account for nearly 70% of total lithium demand, up from 23% in 2017. It's no wonder that Albemarle is so focused on its lithium business. Even if lithium prices remain relatively weak (and don't fall off a cliff), material lithium demand in the auto sector, and production gains from its investment plans, should continue to push the specialty chemicals company's results higher for years. Right now, meanwhile, the company is firing on all cylinders. In fact, it upped revenue and earnings guidance for 2018 when it announced second-quarter earnings. 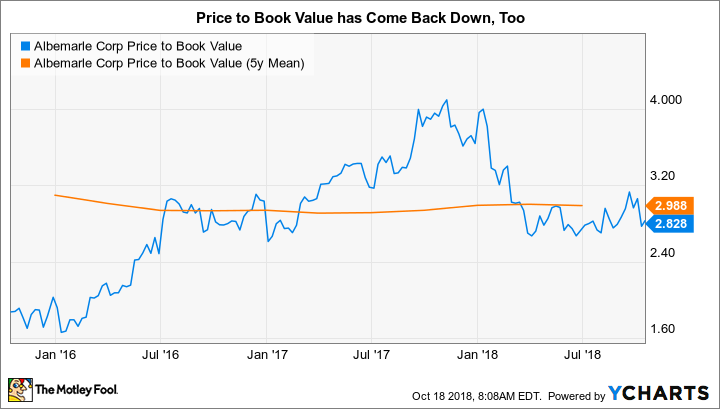 The deep price correction has brought the company's valuation back in line with its longer-term averages. If you have a positive outlook for lithium demand, and believe prices for the key electric-vehicle input aren't going to fall off a cliff, then Albemarle looks like a good option today.